Everyone has had a headache at different times in life and which was taken care of by taking some over-the-counter pain reliever like paracetamol or ibuprofen, or by taking some time off from work to rest. There are over 300 types of headaches and doctors are still working to find out the exact cause of 90% of them known as primary headaches. The remaining less than 10% of headaches occur as a result of medical conditions that directly or indirectly affect the head and its structures like the blood vessels. Cancer patients who start having headache should not hesitate to report to their doctor because it may be a sign that the cancer has spread to the brain. Failure to see a doctor could result in the death of such cancer patients, even if they had already undergone surgery or are receiving chemotherapy to treat the cancer. A headache that comes very suddenly, together with eye pain in the presence of bright light and pain with eye movement, should be reported to a doctor immediately as this may be a sign that a blood vessel supplying a part of the brain has ruptured. If you have a headache in addition to fever, stiff neck, vomiting, convulsions, problem with seeing things, feeling confused or difficulty with remembering things, it may signal serious conditions such as meningitis. Any headache that continues to get worse every day and causes changes in the person’s personality or mental function may be a brain tumour that is getting bigger and compressing the brain tissue. Headaches occurring after a head trauma: a blow to the head or hitting the head against an object during an accident. This is probably a sign of an accumulated blood in one of the tissues surrounding the brain following the head trauma. Any headache occurring with any of the above signs or following the listed conditions such as cancer or trauma to the head should not be left at the mercy of paracetamol. 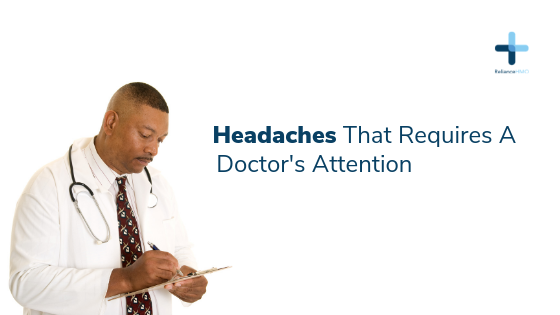 This is because these headaches are caused by very serious, life-threatening medical conditions that must be treated immediately to save the life of the person in question. So, if you experience headache with any of these signs or following conditions like head trauma or cancer, quickly visit a hospital and consult a doctor.